So we have a terrible secret for you, something that you should probably have divined on your own but have likely never given a passing thought. This secret? The number of germs that live on your toothbrush regardless of how careful you are about maintaining it. The number? There are more bacteria on your toothbrush than there are people in New York City, an entire megametropolis of germs living there every day. Relax, they aren’t that much of a threat to your teeth, and your toothpaste is designed to eliminate germs so you’re at constant warfare with them. It is important, however, to make sure your toothbrush dries out between brushings, and every 3-6 months it needs to simply be replaced. In part because wear and tear creates new places for germ to hide, and in part because that same wear and tear reduces the effectiveness of your toothbrush. The ADA, the American Dental Association, emphasizes that replacing your toothbrush every 3 months is ideal, in some cases the toothbrush may last as long as 6 months. What determines the perfect time? Two things, the ferocity of the brusher and the quality of the toothbrush. Those with a heavy hand are going to find that their toothbrushes wear out much faster than those who are gentler with their toothbrush. Of course, the counter-argument is that a more vigorous brushing tends to be more effective, so maybe the increased replacement time is worth it. The other has to do with the quality of the toothbrush, higher quality toothbrushes are made with more extensive testing of the materials and design, and of course, use better quality materials that simply last longer under the strain. Our personal favorites are those that have colored bristles that let you know when it’s time to replace them with a clear visual indicator, it just doesn’t get easier than your brush telling you when it’s time. However, if you’re looking to be truly on top of things, set yourself an appointment on your calendar to replace your toothbrush at the halfway point between appointments. A 3-month rotation of replacing your toothbrush will ensure that you have fresh, effective toothbrushes throughout the year. Want to make sure that you’re really making the most of your brushing? Take the time and money to invest in an electric toothbrush, they’re far more effective than a manual toothbrush and come with easily replaced heads. Why replace the whole thing when you only have to replace the tip? 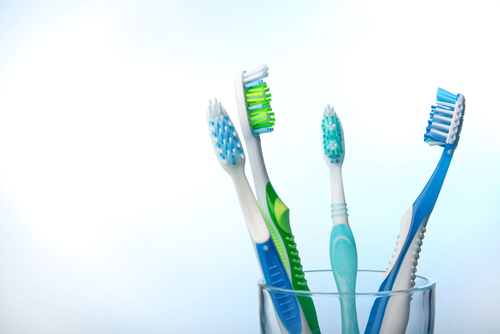 Replace Your Toothbrush… It’s as simple as that. The whole point of this article can be refined down to one point: Replace your toothbrush. Replacing your toothbrush is an important part of making sure your teeth serve you for the duration of your life. Isn’t a great smile worth it?